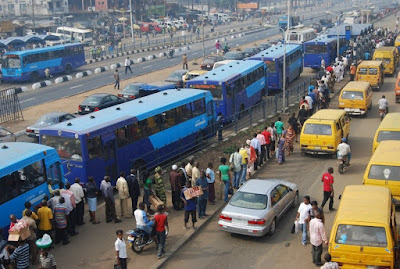 Hundreds of the Bus Rapid Transit system drivers in Lagos State, on Monday, suspended work over the non-payment of their salaries and bonuses for two months. The drivers, who assembled at the gate of Primero Transport Service in Ikorodu, alleged that the management of the company had yet to pay their November and December salaries. The drivers said they did not want a carry-over of their emoluments to 2019, adding that they were suffering as they now live on borrowed foodstuffs and money to survive. They were heard chanting, ‘No pay, no work’; ‘We need our money in full and not half payment’, and ‘Fola Tinubu must go’. A senior driver, who identified himself simply as James, said that there was nothing to be happy about working for the organisation, adding that for the past three years that he had been working with the company, he could not boast of N100,000 savings. James noted that as the protest was going on, the management urged the drivers to go back to work, noting that their entitlements would be paid. He added that few hours after suspending work, they received alerts for the payment of half of their November salary and later some of them received alerts for half of the December salary. James lamented, “We are really suffering despite the fact that we work round the clock driving these big buses. Since they refused to pay us the November and December salaries, we have been surviving by borrowing foodstuffs and money from people. “They paid us part of our November and December salaries so as to pacify us to go back to work few hours ago, but we are insisting on the full payment of the salaries. They are fond of doing this monthly; they never pay us at the end of every month. “Regarding our pension deductions, the management has not remitted them for over a year. It is now that we are on strike that they remitted part of the money for some people. We do not have tax clearance despite the fact that they deduct taxes from our monthly emoluments. Another driver, Kayode Adetona, said he lost his newborn baby because the company refused to pay him his salary or give him a loan to take care of his wife when she was in labour. He stated that he no longer needed the job but wanted the money he had worked for, adding that the situation was so bad that he and some of his colleagues had resorted to begging for money from some passengers. He said, “I need my money. After today, I am no more going to work for Primero. Senior drivers here earn N49,000 monthly, while junior drivers take home N44,000. Even if they were to pay, I have made up my mind not to work here again. The Chief Security Officer, Primero Transport Service, Cletus Okordolor, confirmed the strike by the drivers, but added that the matter had been resolved. He stated that the company did not owe the drivers except the December bonus, adding that they were being paid twice a month owing to the nature of their job, and that not everyone was entitled to the bonus. Okordolor said the payment of bonus to deserving drivers was to curb excessive speeding and other excesses on their part. He stated, “The drivers are paid their salaries on the 10th of every month and on the 25th of the same month; they are also paid bonuses. “Today, they went on a strike alleging that the company owed them November and December salaries. An arrangement was reached on Sunday that before noon on Monday, the company would pay them the November bonus and December salary. These were paid before they started working. “I think at some point, they said something had been omitted – that they had not been paid the December bonus. We then asked them to remember the agreement we had on Sunday that we would pay the November bonus and December salary, which had been paid.